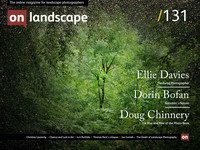 Back in July 2016 On Landscape included a piece that Ellie Davies had written about her then forthcoming exhibition 'Into the Woods' at the Crane Kalman Gallery in London. Ellie has been working predominantly in forests since 2007 exploring both her own and our wider, relationship with them and with the landscape. Her images have reached a wide audience, and we thought it would be interesting to talk to her about her work and about the way in which we perceive nature and the landscape. MG: Would you like to start by talking a little about yourself and telling readers about your background? ED: I have always been interested in photography. My dad had a darkroom when we were young. He and his best friend were very interested in black and white photography, and they taught my sister and me to print. Then I did a lot of sculpture at school and thought I was going to be a sculptor. I did an art foundation course, and quite quickly I realised that I wasn’t sure how to be a working artist at that age. I went on to do a psychology degree, which I loved, but I didn’t want to become a psychologist. It was more a way of trying to find out about where I was going to end up. I really missed making things, and I managed to get elements of creativity in my life by doing a bit of sculpture and jewellery making. But I was just desperate to get some creativity back as part of my work.